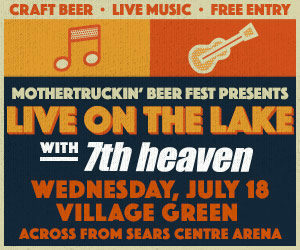 MotherTruckin’ Beer Fest Presents Live on the Lake with 7th Heaven at the Village Green across from Sears Centre Arena. Bar opens at 5PM and 7th Heaven starts at 7pm. Bring along your lawn chairs and a picnic blanket, and enjoy great food & drink along with live music from 7th Heaven.